A toner / lotion is a very important for our skin. You need to know that after the cleansing process we need to prepare our skin for the next stage, which is the moisturizing step. If we don't use toner, the function of the moisturizer can't be maximized. This time I'll share about the toner that I have been using for few months. 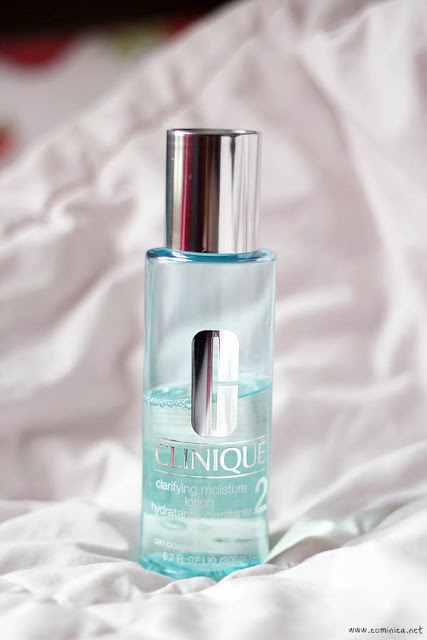 Clinique Clarifying Moisture Lotion 2 is made for Dry combination skin. It is gentle and gradually removes dead surface skin cells. It makes our skin absorb moisture easier and keep our skin smooth. This lotion instantly soothes, softens and brightens our skin. I was looking a good toner for my skin and so happy I decided to try Clinique. I'm so glad I did! It works so great on my sensitive skin and I never experience any allergic reaction. This lotion comes with an ocean blue colored bottle which is really refreshing and clean imo. I use this lotion twice daily with a cotton ball and sweep once over my face and neck after cleansing. I can feel my skin is velvety smooth, ready for my serum and moisturizer. I've been using this toner for few months and love it so far, that's why I want to share it on my blog. If you have a sensitive skin, you must consider to try it. The lotion is quickly absorbed to my skin without make it dry and tight. After use this for few months I can feel that my skin is healthier and smoother day by day. I realize that my skin is rarely get red and itchy again. If there's a pimple during my period, it'll disappear quickly. I also noticed that my scars looks lighter and less visible now. This is a good toner for dry combination and sensitive skin because it contains no Alcohol and 100% fragrance free. It helps to exfoliate nasty dead skin and prime my skin before the moisturizing step. My skin is getting better and healthier now, looks smoother and healing slowly but sure. This softening water lotion balances my skin ph after cleansing and hydrates it. I highly recommend this if you're looking for a good quality toner.